Download our resources and educator guides to bring more fun to self-identity learning at the Museum, in the classroom or at home. The Discovering Your Discrete Selves Education Toolkit is designed to help you and your students explore your own identities. With this worksheet, each of you will investigate whether you, too, might be a series of discrete selves, rather than a single cohesive self. 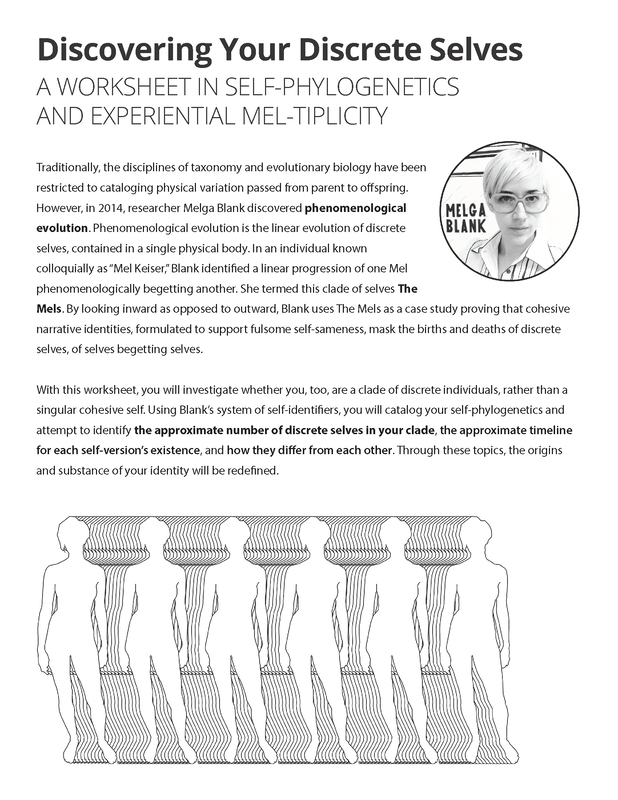 Using Blank’s system of self-identifiers, you will catalog your self-phylogenetics and attempt to identify the approximate number of discrete selves in your clade, the approximate timeline for each self-version’s existence, and how each self-version differs from the others. Through these topics, the origins and substance of your identities will be redefined.